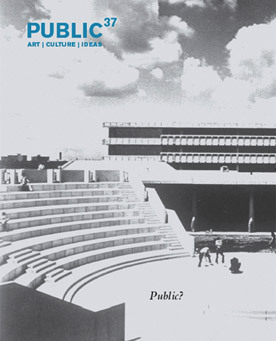 Twenty years ago, in 1988, Public was launched by the Public Access Collective, a Toronto-based group comprising artists, writers, curators, and graduate students equally engaged in theory and politics. In conjunction with the publication of the journal, the collective began to curate exhibitions that utilized urban screens as a means to consider the potential of public art for both engendering insightful, collective experiences and for inciting debates and raising awareness in a city that was quickly privatizing every inch of shared space. Together, Public and its founding collective aimed to bring together theoretical and critical work with artistic practice and collaborations, a project embodied by the inaugural issue, which was devoted to pursuing the questions that emerged out of the urban screen exhibition, Some Uncertain Signs. Since that time, Public has continued its mandate to investigate ideas, theories, and practices of art and culture within the urban context—publishing, in the process, many of the leading voices in the field, including Jacques Derrida, Michel Foucault, Arthur Kroker, Avital Ronell, Giorgio Agamben, and Rosalyn Deutsche. And yet, over the course of twenty years, the landscape underlying the problematic of the public has changed dramatically: the internet has emerged as an important space for consolidating and collaborating under the sign of the commons; spatial topographies have been transformed through new architectures of information and media; temporary autonomous zones have been employed as liminal performative spaces; non-places such as airports offer important sites of critical investigation for artists and activists; counter-publics and scenes have been created through events both spontaneous and community-based; and boundaries (national, urban, and personal) have been rendered at once more porous and more policed. In pursuing this task, we sought texts that could be assembled into a snapshot of the various modes of inquiry relevant to a contemporary thinking-through of the public. We thus open the issue with an essay by the German philosopher Peter Sloterdijk on the Crystal Palace. Available here in English for the first time, Sloterdijk’s tremendously original interpretation of capitalism, democracy, and space—emerging from his epic trilogy devoted to “spheres”—provides an important anchor to Public’s ongoing exploration, rooted in a history of capitalist modes of production. We have also included several historically significant essays that engage with the idea of public in terms of the shared fabric of language, echoing the sense of the public contained in Hannah Arendt’s work, as something that belongs to both no one and to everyone. Language as public, as action, contains the communicative process (namely, translation) that is perhaps the last horizon of what is held in common, while being able to express the singularities which therein arise. We find this spirit equally represented in the starkly beautiful poetry of Cuban writer Victor Fowler, in the stubborn human relationality of the short story by Fyodor Dostoyevsky, and in Dorothy Lee’s reflections on forms of work as participatory and communal in the creation of relationships that cannot be reduced to either use or exchange value. Likewise, we find it in Alain Badiou’s meditations on love as origin of action and the affective space of politics. Several of the essays collected here further engage with the notion of urban mediations, with public space considered in its mediation through film, television, and other technologies. A short text by Vilém Flusser on television in Romania considers the “communicological” aspects of the mediation between public and private as a framework for thinking through the materiality of the virtual in terms of a new networked intersubjectivity. Flusser, the cosmopolitan thinker par excellence (a native of Prague who spent most of his life in São Paulo), well understood the particularity of a politics that needs a public sphere to maintain the tension between society and state. As in every issue of Public, we have included thematic artist projects and have here gravitated towards different articulations of the boundaries between appearance and identity performance. Our next issue, Public 38, will continue our year of celebration and will serve as a companion issue solely dedicated to artistic works. Public 37 aims to re-evaluate and reposition the idea of the public, placing it within the scope of contemporary contexts and concerns. We hope that this cross-section of texts will at once help us reflect upon the past but also look ahead, the product of both return and anticipation. We are grateful to the writers and artists not only for helping us create this special issue of Public, but also for challenging us to think, to make choices, and for forcing us to ask the question: what is public?